Marketers are usually looking to do more with fewer resources. When generating leads from a myriad of different sources, the name of the game is ingesting new leads quickly, validating, enriching, scoring, and routing them to our sales team for follow-up. There are plenty of studies showing that MQL to SQL conversion rates degrade with slower follow-up time - and it makes intuitive sense. If a lead fills out a demo request form on Monday, then doesn't hear back from the company for five days, they'll likely move on. So automating these processes is one of the best investments that a marketing organization can make to improve revenue growth. We have some lead sources that send us files sporadically via email or CSV which makes it hard to plan my week. Each time I get an email from a vendor that contains fresh leads, I have to stop what I'm doing to ensure they don't get stale in my inbox, waiting to be imported into our CRM. Especially since we already have sales triggers set up for all new leads in Outreach to ensure follow up happens within minutes! That's why I used Tray to build an automated workflow that extracts lead list data sent from vendors and automatically loads that data into our marketing automation solution (Marketo) and subsequently into Salesforce and Outreach. This automation allows us to get leads in front of salespeople within seconds. You can register for this webinar for more step-by-step examples of integrating and automating lead management processes. Case A: I’d recommend that you read this blog post on how to sync CSV files to Marketo as leads. Case B: Webhooks are relatively new so not all vendors support them. If yours doesn't offer webhooks but offers an API, then you can create an automation from there. The steps are a bit different but still easy enough for a marketer to automate. Case C: Luckily, the bulk of these leads come from our G2 Crowd listings, who supports webhooks. What are webhooks you might ask? Webhooks from your cloud app proactively send out a signal to another system when data changes. So when a new lead lands in my vendor’s database, a webhook tells my integration and automation platform, Tray, and Tray pulls in the new lead and related data. You can read up more on webhooks on this Wikipedia article. Webhook. Set-it and forget it. The webhook “listens” for changes in data. Get more information about lead from Clearbit. We’re usually looking for up-to-date job title information. Authenticate Marketo. Opens access to Marketo’s API. Get the lead data into the right format for Marketo. Upsert the lead. This function looks at your Marketo instance, and if the lead is new, it will create a new lead in Marketo. If the lead already exists, then Tray will simply update the lead record with new data. 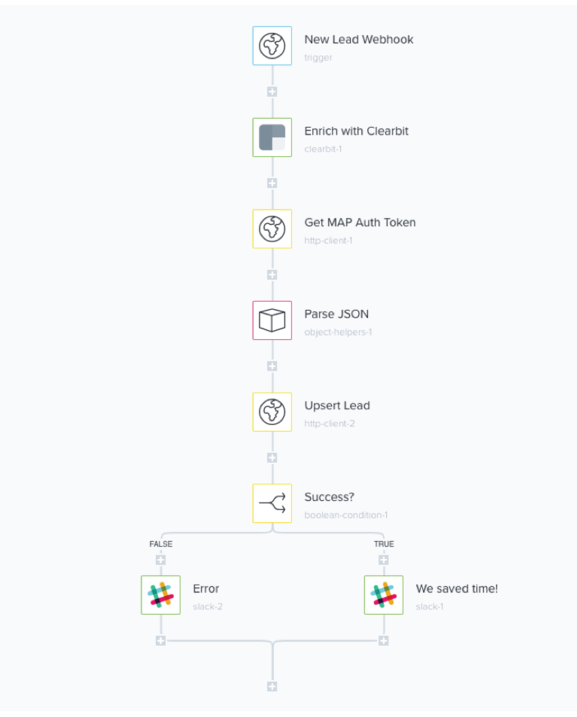 This workflow step always triggers a smart campaign for us so we can process the lead accordingly. Finally, we’re a big fan of sending ourselves Slack alerts when things go well as well as when things don’t-- so we can quickly look into the issue. Here we’re looking for a 200 status code from Marketo and making the decision on which message to send to the team. And that’s it. Configuring these four steps probably took 20 minutes, and saves 10 to 15-minutes from each manual upload and, multiplied by hundreds of lead lists a year, frees up considerable time for our team to focus on more strategic activities. Of course our sales team is thrilled to get these leads right away. Our lead to SAL conversion rate has gone up. High-fives all around. Read the full Outreach story for more ideas on boosting growth by closing workflow gaps. Outreach, the leading sales engagement platform, automates and prioritizes customer touch points throughout the sales process, resulting in increased productivity for sales teams. Thousands of customers rely on Outreach to transform the sales process, drive collaboration between sales and marketing, and deliver higher revenue per sales rep.
Headquartered in Seattle, WA but with offices in San Francisco, Tampa, FL, and State College, PA, Outreach has been named by Seattle Business Magazine as the best mid-sized company to work for in Washington, one of the state’s 100 best places to work overall, and is one of Forbes' 2016 World's Best 100 Cloud Companies. Outreach has received $60M in funding from top tier investors including DFJ, Trinity, Floodgate, Mayfield, and Microsoft.